The GPhC have proposed that online pharmacies will have to put in place new safeguards to protect people who want to obtain medicines online, including opiates, antibiotics, asthma inhalers and Botox. From 26 June to 21 August 2018, the GPhC encouraged patients and the public to share their views on the proposals (read more). 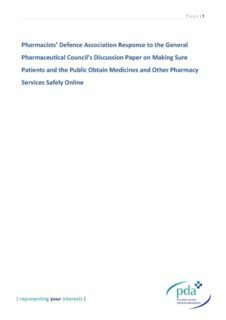 The PDA generally support the GPhC’s proposals because we believe they will help make online services safer and more effective. 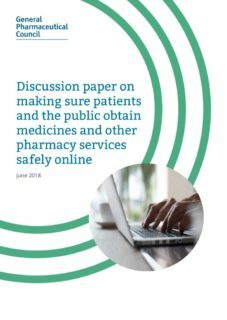 In order to help ensure the safety of patients and the public, any provisions made by the GPhC as a result of this consultation in relation to online pharmacy services and medicines supply must be set out in the form of enforceable requirements. The GPhC must strengthen the requirements for verifying patient identity, to reduce the possibility of a person impersonating a patient or providing a false identity. Patients and prescribers should have the option to request a video consultation if required, and it should be clear which online providers offer this service. The GPhC should ensure that online pharmacy websites are accessible to patients with cognitive, sensory and learning difficulties by setting a minimum standard of accessibility. Words don't quite seem enough to thank you both for your expertise and support. The progress I have made with your help is absolutely priceless and prior to yesterday I was just so elated to be back to my old self, if not a more improved, assertive version 2.0!